SINGAPOREANS keen to enter the process engineering services sector, a vital support to manufacturing, could benefit from an agreement signed yesterday. Under the memorandum of understanding (MOU), five industry players are expected to recruit and train up to 46 Singaporeans in the industry over the next two years. They will receive up to $1million in funding from the Singapore Workforce Development Agency (WDA), which signed yesterday's MOU with the firms. The participating firms - Hai Leck Holdings, HSL Constructor, Mun Siong Engineering, Rotary Engineering and Shao Fook Engineering - are members of the Association of Process Industry (Aspri), representing sector members. The process engineering services industry is one of the largest within Singapore's manufacturing sector, employing more than 100,000 people. Firms in this cluster provide engineering, procurement, plant construction and maintenance services to chemicals, pharmaceuticals and environmental technology companies. The industry contributed more than 3 per cent to economic output here last year, staying resilient amid economic uncertainty. But local industry players must be more competitive as they face increasing competition from global and emerging regional players, said Senior Minister of State for Trade and Industry Lee Yi Shyan, who witnessed the signing ceremony at the Singapore Island Country Club. This would mean undertaking high value-added work as firms rise up the value chain. Workers will thus be required to multitask and undertake more complex jobs. Mr Lee said the MOU was timely, given Singapore's recent productivity push and the emphasis on local firms to reduce their reliance on foreign workers. "The MOU will help nurture a sustainable pool of local skilled talents to meet the immediate and future needs of the industry. It will also provide a structured development and career progression pathway to attract more Singaporeans to join the industry." The full name of the manpower scheme is the Development and Apprenticeship Programme for the Process-Engineering Services Industry (DNA-PRO). The 12-month programme will comprise Singapore Workforce Skills Qualifications (WSQ) training, company-specific training and structured work placements. Firms in the scheme will receive funding support to recruit and train the new workers. 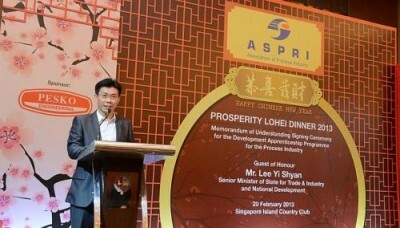 Aspri's president Charles Quek said he hoped that in the longer term, DNA-PRO would ensure a consistent pool of skilled local manpower for the industry's present and future needs. "By taking part in DNA-PRO, the companies will have greater incentive to recruit Singaporeans and Singapore permanent residents who are new entrants to the industry, and provide them with structured training and suitable career paths," added Mr Quek, who is also executive director of HSL Constructor. There are existing schemes to develop manpower for the process engineering services industry. Since 2009, more than 3,500 trainees have undergone WSQ training at the training arm of Aspri.